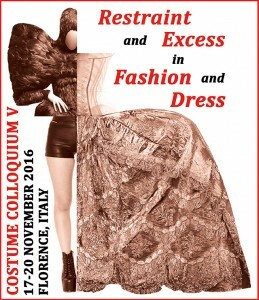 The Advisory Committee and organizers of the next Costume Colloquium dedicated to Restraint and Excess in Fashion and Dress are seeking new and unpublished papers for the 2016 conference. As with all the previous Costume Colloquium conferences, presentations can be made on material of a theoretical and/or practical nature. Not only informative, but also inventive and creative presentations are welcome. Opulent decorations, jewelry, handbags, shoes, etc. 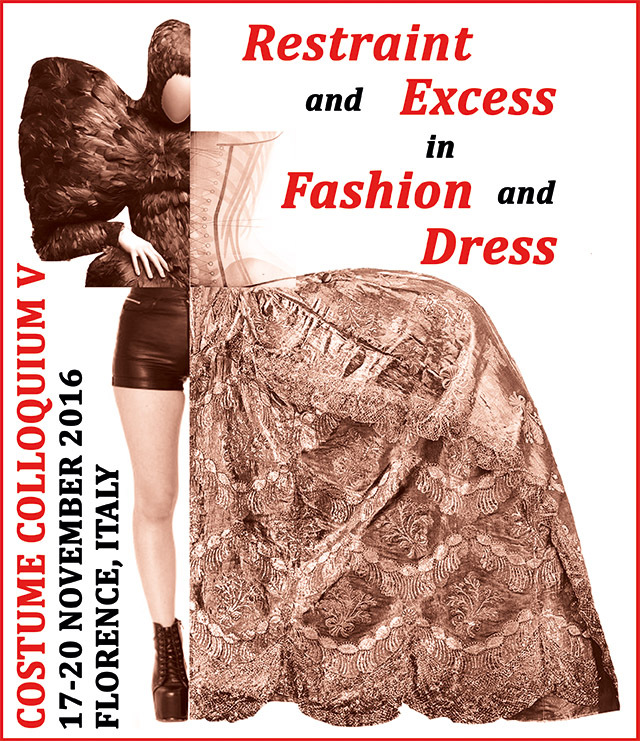 Send your proposal abstract to info@costume-textiles.com with Abstract Submission CCV in the subject line, using the CCV Submission Form that you can download HERE. Only abstracts using the form will be accepted. – Language for the abstract submission is English. – All the personal data for the author and the co-author(s) must be filled out. If there are no co-authors please leave the space blank. If there should be more than 3 co-authors add the table lines underneath as needed. – Your affiliation and your job title (and/or description) are requested. Please consult past Costume Colloquium programs on the website (www.costume-textiles.com) for examples. – The abstract text can be a maximum of 400 words. Should your abstract proposal be accepted, the text you submit will be published unedited online as it is received. – Include a brief autobiography (200 words maximum). This should describe your current field of interest and highlight your more significant or pertinent accomplishments. This should be a description rather than a list of your activities and publications. – You can include a list (maximum 5 entries) of publications that best represent your expertise. – If you have images (maximum 5 no larger than 1mb total) to support your proposal, include them in the CCV Submission Form in the indicated field. Costume Colloquium is unable to pay for any expenses involved in the preparation and presentation of papers. Please obtain all necessary permissions for use of images before the presentation is given. June 15th 2015 exte: Abstract submission deadline. Your proposal abstract and brief autobiography must be received via email no later than midnight Italian local time. October 15th 2015: Notification of paper acceptance. Candidates who pass the selection will be informed of the Advisory Committee’s decision. October 31st 2015: Notification of speaker acceptance due. Written confirmation of acceptance on the part of the presenter must be received no later than midnight Italian local time. Please note that non-selected papers will be held on a reserve list and the top ten are plausible candidates in case of a non-acceptance. Successful candidates (one only if multiple authors) will not pay the base conference attendance fee however they are required to pay a “speaker fee” of 140 euro (VAT included). Multiple authors will have a benefit of a reduced attendance fee (to be established). Travel, accommodation and board expenses will not be covered.